No one can comprehend or fully account for this Zionist mentality of callous indifference toward the murder victims of the Israeli military without being conversant with Talmudic culture and ethics; at the heart of which is the concept of Judaic racial and spiritual superiority. That is the reason why the conscience-on-its-sleeve liberal media turns its back on the remembrance of the slaughter of the Arabs by the Israelis. 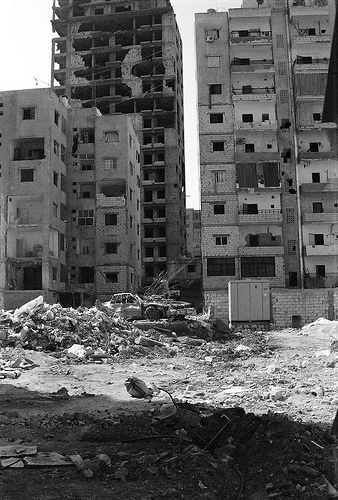 On the 30th anniversary of the Sabra and Chatila massacre the New York Times printed, with regard to the visit to Lebanon by Pope Benedict XVI, “Lebanon is still rebuilding from a devastating 1975-1990 civil war fought largely on sectarian lines…” (16 Sept. 2012, p. A14 print edition only; online edition has been bowdlerized). “Civil war”? Was it the Lebanese who bombed Beirut from jets throughout the summer of 1982? Actually it was Sharon’s aerial terrorists, but that fact is forgotten and covered up. The NY Times implies the Lebanese did it to themselves. How perverse. Notice that the reference to “rebuilding” Lebanon is limited to destruction perpetrated during the years 1975-1990. No mention is made of the massive destruction Israeli bombs, rockets, missiles and artillery fire visited upon Lebanon in the summer of 2006 in the course of which hundreds of Arab children were killed and thousands of homes and businesses were destroyed. Just before the Israelis withdrew in 2006 they dropped tens of thousands of land mines all over the Lebanese countryside to guarantee years of crippling and maiming injuries, mostly of children who attempt to pick up the bomblets, thinking they are toys. A question for the New York Times: is Lebanon “rebuilding” from the Israeli holocaust in 2006? Apparently not, because your timeline stops at 1990. The entire Israeli war in Lebanon of 2006 has been omitted from the New York Times’ remembrance. In the same issue that makes these deliberate and flagrant omissions, there is an obituary for “Holocaust Survivor” Eli Zborowski, who is celebrated for supporting “Holocaust Remembrance.” In his N.Y. Times’ obituary we read, “In 2000, when the pope visited Yad Vashem, some criticized him for declining to comment directly on the church’s silence about Hitler’s crimes during the war…” (16 Sept. 2012, p. A25; [published online Sept. 12]). Always these self-righteous accusations in the face of Judaism’s own extraordinary hypocrisy! What about the “silence” of the New York Times concerning Israeli crimes during the First and Second Lebanese wars of 1982 and 2006? The explanation of the disparity between suffering remembered, and suffering dismissed, is that “Jews” are human beings, and deserve commemoration, reparations and remembrance. Whereas the Arabs are sub-humans who deserve obscurity, anonymity and ignominy. Or as the Talmud informs its followers: “You are called men, but the gentiles are not men” (BT Bava Metzia 114b). When are people going to realize and or admit when we speak of NAZI we are speaking of AshkeNAZI…it was not Hitler who murdeered Jews…It was jews who did the deed! Look uup Earnest Zundel and read read read! Investigate instead of listening to media and reading books by those who lie and can’t get their stories straight. Why do Western Nations support the ORIGINAL nazis? They engineered the Ukrainian HOLOMODOR, a HOLOCAUST of 60millions of Christians..
Jews secretly instigate and aggravate the genocidal muslum invasion of Christian Europe to clear population so Israel can steal MORE land for “GREATER” Israel…..
(2) http://mondoweiss.net/2018/04/influential-soldiers-genocide/ Rabbi Ophir Wallas of the Bnei David Military Mechina was caught on video teaching young would-be soldiers that Israelis are, from the halachaic point of view, permitted to wipe out Palestinians, and that only fear of massive retaliation prevents that . 300 million mass murdered by the Satanic = TALMUDIC = “JEWISH” terrorists in the last century. Ashkenazim so-called “Jews” are not of the Semite “Race”, and although some may argue they are members of the human race the Talmud places them in the maybe category. one can only gawk with astonishment at the end gamed RESULT of this JEWISH fantasy….John 8:44. Holohoxes are remembered. Holohoxes have become an extortion racket. Holohoxes are used to justify genocide, terror and theft. While real holocausts -Shabra & Shatila, Deyir Yassin, Al Nakba (to mention a few), are deliberateöy written out by zionist media. The Palestinian people lives! Despite the worst that the Zionists have been able to do, despite their appalling cruelty and depth of racism almost beyond imagining, despite their continuing extreme violence, they have not succeeded in exterminating the Palestinian people, nor in erasing the memory of them from history. The Palestinian people have endured terrible suffering, but they will triumph in the end.